Mega Man Zero, known in Japan as Rockman Zero​ (ロックマン ゼロ), is a video game developed by Capcom for the Game Boy Advance (GBA) handheld game console. It the first installment in the Mega Man Zero series, the fifth series in Capcom's Mega Man video games franchise. It is the first Mega Man platformer to appear on the GBA and was released in Japan on April 26, 2002, in North America on November 9, 2002, and in Europe on November 26, 2002. 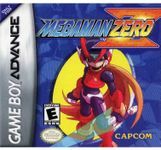 Mega Man Zero is set 100 years after the end of the Mega Man X games and follows the Mega Man staple of side-scrolling platform action. The player takes control of the Mega Man X character Zero and guides him across several missions, defeating a boss near the end. As is common with Mega Man games touching spikes means instant death (except spikes touched during the limited invincibility period granted by taking damage). Continuing the "tradition" from the Mega Man X series, Zero can cling to walls (albeit he slides down it at a uniform rate) and dash. When clinging onto walls, pressing the jump button and the D-pad in the direction opposite to the wall, makes Zero soar off the wall halfway up the screen (referred to in the manual as wall-kick). Unlike previous Mega Man games, instead of separate stages, there is a mostly single interconnected overworld with the Resistance base at its center, where almost every area in the game can be explored freely (a feature that is removed in later Zero games, but returns in Mega Man ZX). In place of the stages is a choice of missions that Zero can undertake in each of the separate areas of the map, and completing one may unlock others. There are still bosses to fight in these missions, but not every boss is fought near the end of the stage. It's also possible to fail non-critical missions and continue on with the game, either by using the "Escape Unit" or by choosing to "give up" a mission after losing a life. Doing so marks the mission as a failure, and it will no longer be available; as well the player will miss out on several important items in doing so. Source: Wikipedia, Mega Man Zero (video game) , available under the CC-BY-SA License.